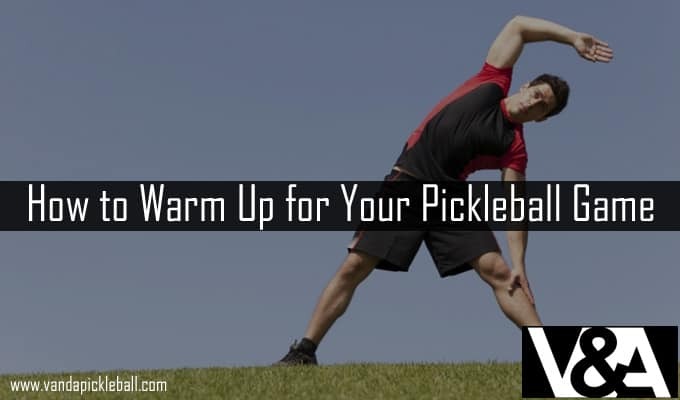 How to warm up for your Pickleball Game. Importance of warming up. What’s the quickest way to get injured during any sport? By not warming up. If you don’t warm up before your game, whether it’s a tournament or a backyard session, you’re going to get injured. That’s why we’ve decided to show you how the 5.0 players warm up before any game. That way, if you warm up like them, you can start learning how to play like them. Don’t be surprised that most of these warm ups are things that you have already been doing. The 5.0 players are ordinary humans, after all. This will get your heart rate up and it is a universally accepted warm up. If you’re nervous about a big tournament, go for a jog off-site. Just around the corner if you’re unfamiliar with the site. This will be able to clear your head and calm your nerves as well as prevent injury. If that gets boring, do a little side step, a skip or even a hop if you want to. By adding variety to your jog, you won’t get bored and you will be able to loosen more muscles that way. You can even try walking backwards if you’re confident enough! If you’re playing with a partner, then take them with you since it will help you bond as a team. The main reason you’re jogging is so that you can limber up those legs! So, no gossiping! In Pickleball, you know how important your hands and wrists are to your game, so you need to keep them happy. You can do this by using your paddle to stretch them. Remember to rotate your wrists and stretch out those hands. To start off your warm up drills, find an empty court and start dinking with a partner. Start out by dinking across from each other. Once you’ve got the hang of things, start moving towards opposite ends of the court, still dinking. From there you can transition from dinking to volleying, using the same technique. Remember to use different serves while volleying. By doing this, you’re warming up your legs and waking up your reflexes, you will also be boosting your confidence a little bit before walking out to meet your opponents. Once you’ve warmed up a bit, take a step back and start taking harder and more difficult shots. Think about long shots, power shots, soft serves and the like. Only do this for a few minutes since you don’t want to tire yourself out, but doing a few serves this way will do wonders for your energy. You’ll feel ready to win your game! Once you have been playing for a while, you will start creating your own little warm up routine, and that’s okay. Just always remember to do it, and you shouldn’t have a problem. Get out there, arm up and win your game!